We love the King at ClearWorld, everything about him and the electricity that he brought to the world during his time in the sun. Some of these things that he did, we like to think are reflective of ClearWorld. We believe we can change the world in the same way that Elvis changed the music scene. In fact, Elvis at one time in his life drove a truck for Crown Electric Company, Inc. in Memphis, which was one of his first jobs. We believe that Crown Electric eventually became a CED store, adding to our connection to the King. 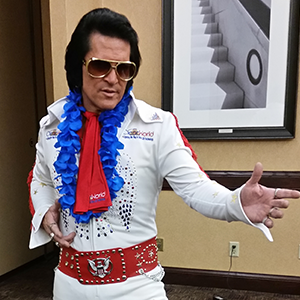 If you have attended one of our presentations, you have likely seen an appearance by the ClearWorld King. Our version likes to make sure that presentations are well attended and, more importantly, entertaining. It has almost gotten to the point where we are taking requests to learn more about ClearWorld and see Elvis entertain our customers. Find out more about ClearWorld Elvis and talk to us about coming to see your group and getting a special visit while we are there. He has generated a lot of excitement and buzz for ClearWorld. Just be sure not to step on his Blue Suede Shoes.